Hi everyone! Everyone’s just settling in for this next panel. We’ll get started in a few minutes. Pineau: Our CEO told us years ago he wanted to be able to drop the print product as soon as possible. We're hoping the app can be our flagship product over the next few years. The principle of the app is quite simple: you have all the sections that you'd otherwise have in the daily print newspaper. Most users will go to the front page and swipe through the edition. They can also read in larger text if they're old, or like me like to drink their coffee while reading off the tablet. The financing for this is 100% advertising based. You can share stories directly from the app from almost any social platform. And while the tablet editions are somewhat fixed, you can opt to get updates sent to you directly from the website. He shows us two pictures taken when the Popes were elected in 2005 and 2013. For Benedict's 2005 election, one person in the photo had a phone. For Francis, 90% of the people in the photo had one. Newspaper layouts haven't changed dramatically from the 1960s to now. Newspapers haven't changed much. We know these things well: younger generations aren't reading the print product anymore, advertising revenues are down, and most people are accessing news online. La Presse tried making its print product different. In 2008 they redesigned dramatically, but it wasn't enough. By 2011, once they had a tablet edition available, they saw its growth and market penetration rates were more promising than any other metric. There are 2.4 million tablets in Quebec; 45% of the population owns one. To build the app, they invested: $40 million and 36 months of development. In designing the app they decided the reader needed to be at the core of the product. "We needed to have a new product, around the reader, to take full advantage of the possibilities of the tablet. One thing we didn't want to miss is the user experience." Relates this to the difference between the traditional glass bottle of Heinz ketchup, and the easier-to-use squeeze bottle. The product is the same; their use is entirely different. We had to work a lot on ourselves and our processes internally. It's not a secret that in news organizations people work in silos and don't really communicate with each other. We're not there completely yet, but the principle is that we talk to each other a lot more. I won't get too much into the tech side of things, but quickly: to produce the app, we had about 25 different types of software, from the production of news content, to booking of ads, to producing the ads. It's a bold statement that the app is for free. Our CEO at the time didn't think we could succeed in this without giving the product away for free. We may have been able to make a few thousand people pay for subscriptions, but never enough to make up for ad revenue. We had the opportunity to start from scratch. Our competition is no longer news TV, etc. It's now Google, Twitter, or any platform that can provide instant information. For the app, they brought back a lifestyle section called Pause that didn't work out in the print edition, but for the app they were able to raise enough advertising for. New opportunities for storytelling forms: data journalism, zoom and graphic journalism. There was a fear that with too many features in how news was presented it would be seen as a product with bells and whistles. So they also invested more into their investigative team. Another big investment area: photography. They went from 9 photographers to 14. A videographer team of 15 to 30. We also had to re-think the website. In 2013 was all about breaking news, and stories went up after it was published in print. We started to focus less on putting long-form stories on the website, saving them for the tablet. People spend more time with the tablet and there's more monetization opportunity ad-wise, with longer stories on the tablet. Our new tablet workflow is not so different from the old one when you look at it from a bird's eye view. We're still about ideas and events, and we try to plan. We go out into the field, report, shoot video and photo. We write, aggregate and publish. It's just slightly more involved with the tablet. We actually found we were publishing more text on the tablet app than we thought. 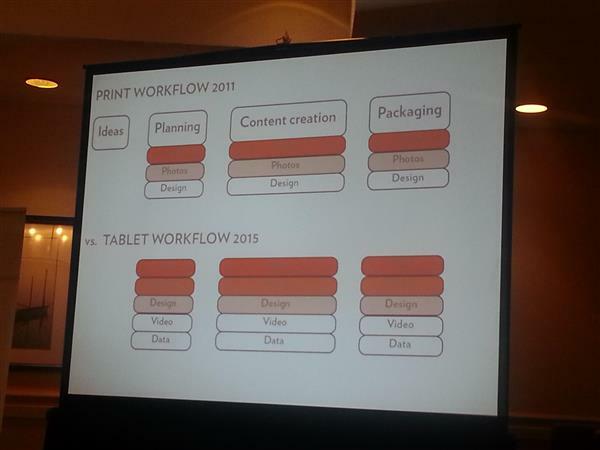 A look at workflow for print vs. the tablet. Darker orange represents more concentration of content. One of the main challenges we had was that in the newsroom, we have always had a clash between editorial and designers, who see themselves on either side of a fence. Over the past 10 to 12 years, with redesigns, etc., the team has gotten better at communicating with each other. It required a culture change. Another culture change: when they merged the online and print desks in 2008. The one thing that hasn't changed in the newsroom since 2011: the layout. "We invested in people and technology rather than layout and furniture. We moved people who needed to talk to each other closer together, and that's about it." On ads: Making them interactive has encouraged readers to spend more time with it. Surveys of readership has found that 56% of readers like the advertising, 10% don't like it at all, 34% somewhat like. 74% of readers are morning; 34% are evening. Broken down: 66% early morning, 8% afternoon, 26% night. Demographics: about 50% of our audience has a household income of $100k. Average age is 35. Audience Q: Who decides what kind of form a story is going to take on a tablet? Pinneau: We think the reporters usually know what the best story and form for their field is. It's their beat. But we do fight a lot—that's our French side, I guess. Pinneau: But there are times when there are disagreements. When you realize it won't be a long-form text story, will just be a few paragraphs, the print people are sometimes not happy. Pinneau: Reporters aren't allowed to shoot pictures in the first place, because of union rules. But generally the idea is that you let people with specializations do what they do. Q: Are you hitting your financial goals? Pinneau: I can't speak for the people who handle this, but I'd say pretty good. Sixty per-cent of our revenue in this comes from ads—and they're staying flat rather than dropping. Which is pretty good these days. Pinneau: Mentions the Star's project to adopt a new tablet edition using La Presse's technology. "They don't plan to dump their print product as soon as we plan to do; different market." Q: Is tablet peneration in Quebec different than what we've seen in the rest of Canada? Pinneau: Not sure about differences between French/English Canada. We don't see the flattening of tablet sales as a threat. We're aiming at the top of the audience--someone who's not able to read our product and doesn't have the financial means to buy a tablet would likely not have interacted with this product in the first place. Q: What time does the tablet edition become available, and what's the content deadline? Pinneau: We guarantee delivery to readers by 5:30 a.m. But usually we deliver by 2:30 a.m. The deadline is not as hard as a print one would be, but usually it's around 12:30 the night before for the finished product. The reporter can file up until midnight. Pinneau: For the Scotland referendum, we extended the deadline to 3:00 a.m., for example, because that was a really important story for us. And that wraps up this panel. Thanks for tuning in!